In this article, we will learn the important object-oriented concept - Abstraction. Abstraction means hiding lower-level details and exposing only the essential and relevant details to the users. In this post, we will learn Abstraction concept in detail with examples. Abstraction means hiding lower-level details and exposing only the essential and relevant details to the users. 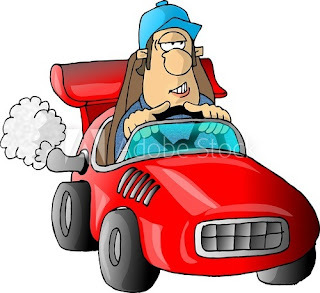 The first example, let's consider a Car, which abstracts the internal details and exposes to the driver only those details that are relevant to the interaction of the driver with the Car. The second example, consider an ATM Machine; All are performing operations on the ATM machine like cash withdrawal, money transfer, retrieve mini-statement…etc. but we can't know internal details about ATM. The third example, we never buy a "device", but always buy something more specific: iPhone, GSII, Nokia 3310 etc Here, iPhone, GSII, and N3310 are concrete things, the device is abstract. 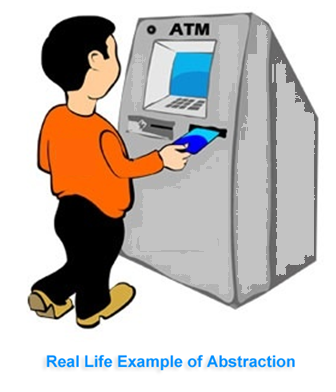 Let's understand Abstraction concept with Java programming examples. 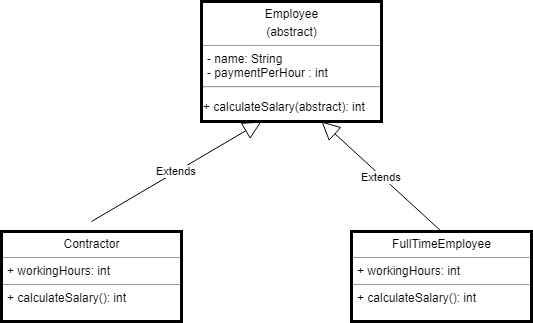 In this example, we create an abstract Employee class and which contains abstract calculateSalary() method. Let the subclasses extend Employee class and implement a calculateSalary() method. Let's write source code by looking into an above class diagram. Step 1: Let's first create the superclass Employee. Note the usage of abstract keyword in this class definition. This marks the class to be abstract, which means it can not be instantiated directly. We define a method called calculateSalary() as an abstract method. This way you leave the implementation of this method to the inheritors of the Employee class. Step 2: The Contractor class inherits all properties from its parent abstract Employee class but have to provide its own implementation to calculateSalary() method. In this case, we multiply the value of payment per hour with given working hours. Consider the second example Shapes base type is “shape” and each shape has a color, size and so on. From this, specific types of shapes are derived(inherited)-circle, square, triangle and so on. The area for these shapes are different so make the area() method abstract and let the subclasses to override and implement. The source code of this article available on my GitHub repository at OOPS Concepts Tutorial. If you like this article then give a star to this repository. Examples are very good with explanation. Very nicely explained OOPS concepts.